Bib shirts were popular military wear and worn by militias and firemen, but they really never caught on with cowboys. During the heyday of Westerns on television and movies they were somewhat popular. Yep, John Wayne wore them in several films, including The Searchers, The Man Who Shot Liberty Valance and the John Ford cavalry films. That inspired lesser-knowns to imitate the Duke. But that was Hollywood, not real life. 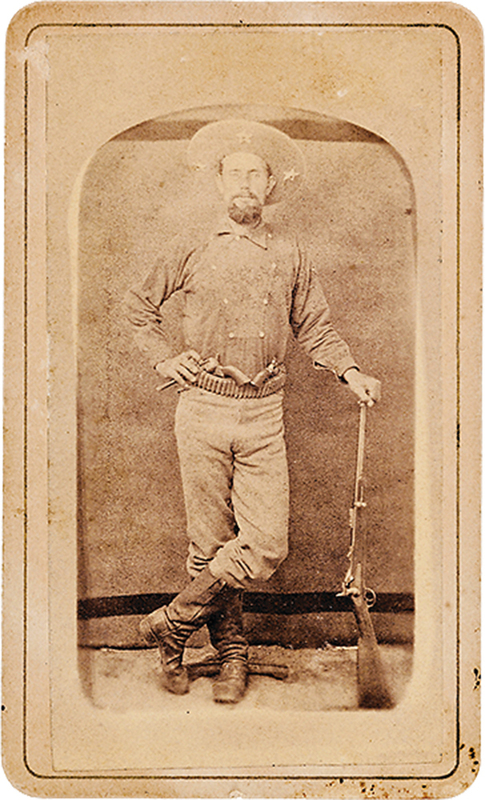 In this circa 1870s photo, this stylish, triple-armed Ranger wears high boots, a bib-front shirt and a wide-brimmed hat that is embellished with stars on the underside. What was the cost of the westward wagon trains? Death by Association Charles Cooper shouldn’t have seen a gunfight.